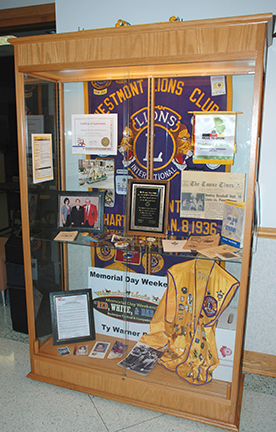 The Village of Westmont has created an historical display at the Village Hall, 31 W. Quincy Street, in honor of the Westmont Lions Club's 80th Anniversary. More than 40 items have been collected for this project. The display is on the second floor and is open to the public Monday through Friday, 8:00 a.m. to 4:00 p.m. The display will continue through the end of March. * The Westmont Lions Club hosts the annual Red, White & BBQ Festival, which has become one of the biggest BBQ competitions in the Midwest. * The Westmont Lions Club is involved with a number of annual community events including Westmont Street Fair, 4th of July Celebration at Ty Warner Park, Taste of Westmont, Westmont Holly Days Winter Festival, and more. * The Westmont Lions Club hosted the Peace Poster Contest this past year, which included the involvement of Westmont-area middle school students. * The Westmont Lions Club has provided more than $30,000 in local scholarships over the past 15 years. * The Westmont Lions Club has provided food at numerous community events over the years, and in doing so, has flipped about 750,000 pancakes, shucked about 40,000 ears of corn, and cracked about 30,000 eggs. * The Westmont Lions Club has purchased over 500 pairs of eyeglasses and hearing aids for people in need. * The Westmont Lions Club has supported various charitable causes including SEASPAR and the People’s Resource Center.